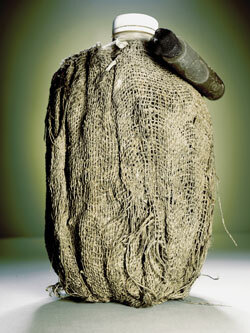 A burlap-covered water bottle found by De Leon. Photo by Jeff Corwin. Archeologist Jason De Leon uses discards left through undocumented migration on the US/Mexico border to narrate the social, political, and geographical elements of one of the world’s largest ongoing modern-day migrations. The University of Washington has published a full length article about his work. De Leon says he never ceases to be surprised or moved by the things he uncovers at the hundreds of sites he has visited, places where migrants gather to rest and sleep during the heat of the day as they navigate their way through the horrors of the Mexican border, through the dangers of the desert, and past border patrol to make their way into America. I highly recommend reading the full article. Like William Rathje’s Garbage Project at the University of Arizona, De Leon’s Undocumented Migration Project is analyzing contemporary discards to gain insight into hidden but epidemic social and political phenomena. He is able to discern approximate numbers of immigrants crossing at his sights, the effects of increased security, the gender and ages of individuals, and is piecing together untold stories of violence and perseverance from both his archeological methods and ethnographic research. 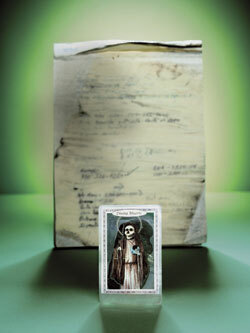 A “coyote’s” notebook and a Santa Muerte card recovered by De Leon. Photo by Jeff Corwin. J. De León and J.C. Cohen “The Material Probe in Ethnographic Interviewing.” Field Methods 17(2): 200-204. This entry was posted in Anthropology, Difference: Class, Race, Gender, Labor, Methods, World. Bookmark the permalink.